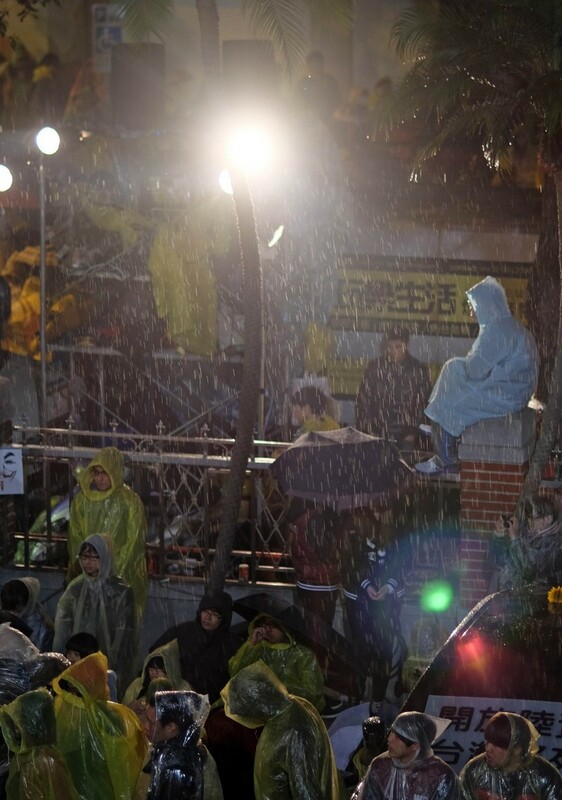 Protesters are sprayed with a water cannon during a demonstration outside the Executive Yuan in Taipei early on March 24, 2014. 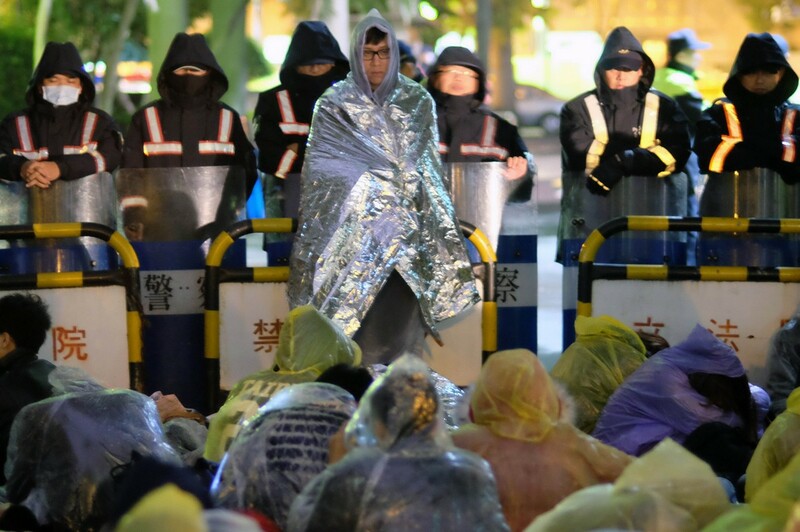 TAIPEI - Taiwan riot police used water cannon Monday to dislodge hundreds of demonstrators who stormed government headquarters, escalating a protest over a China trade pact that has seen parliament occupied for nearly a week. 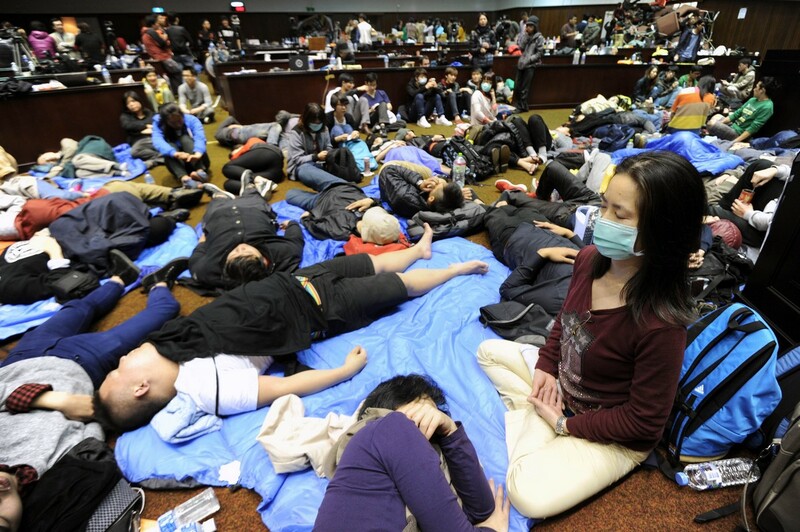 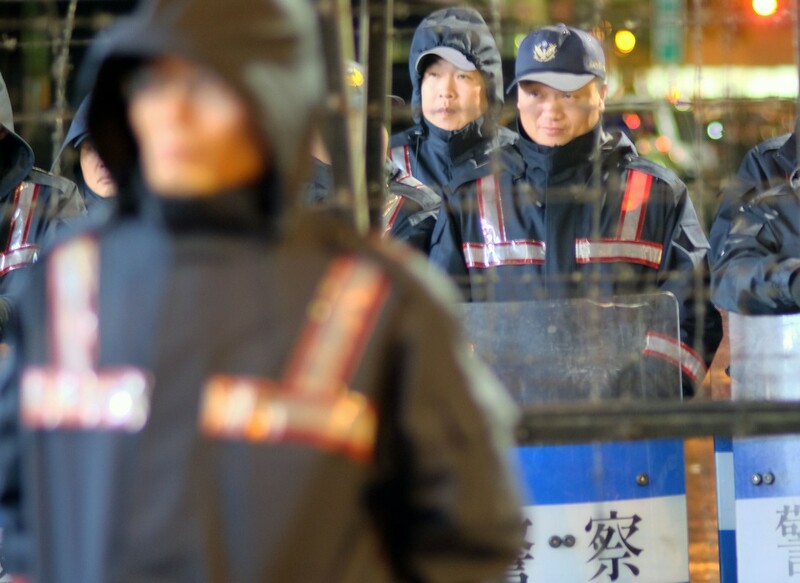 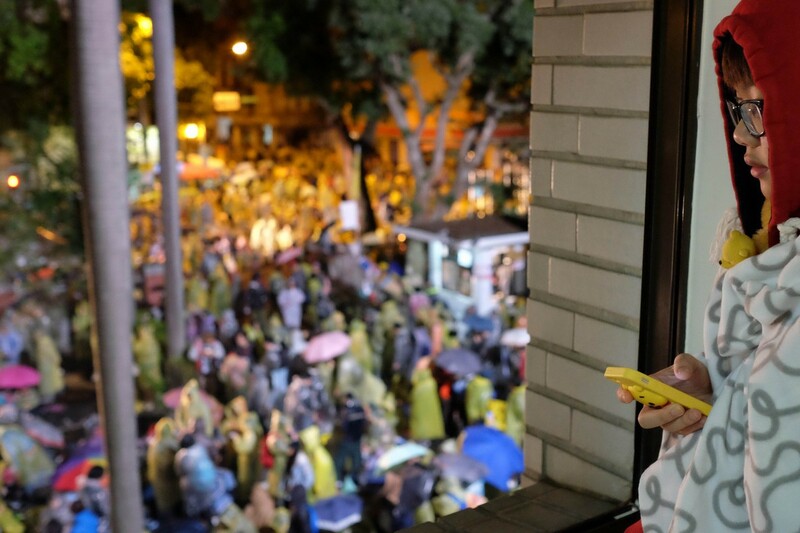 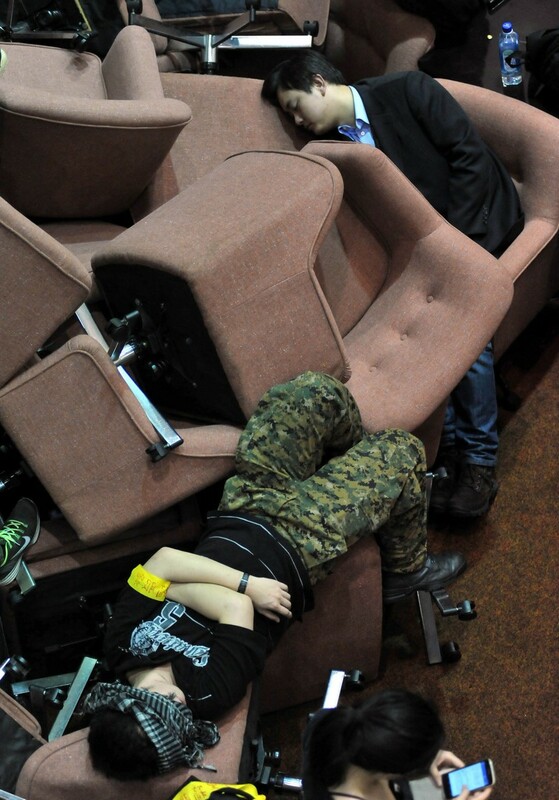 A total of 1,000 officers were deployed overnight to remove the protesters from the Executive Yuan where the cabinet is located, Taipei's police department said, adding that 32 people were arrested. 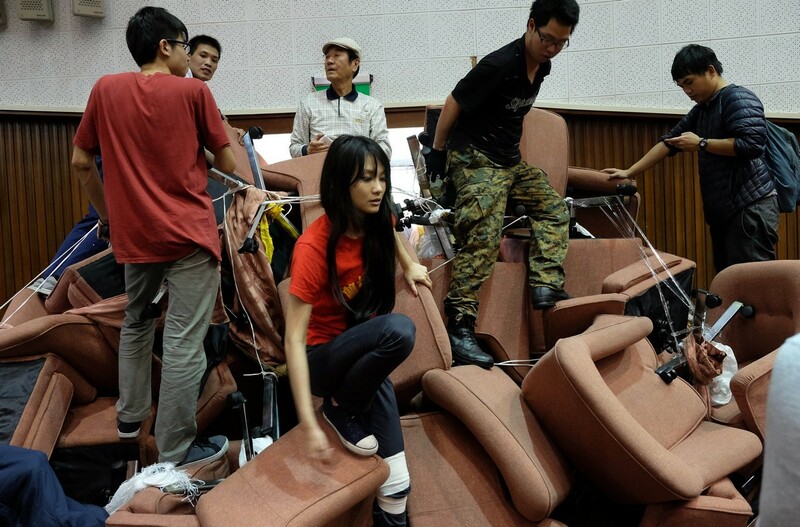 In wild scenes, demonstrators pulled down barbed wire barricades surrounding the government building, and used ladders to break into offices on the second floor. 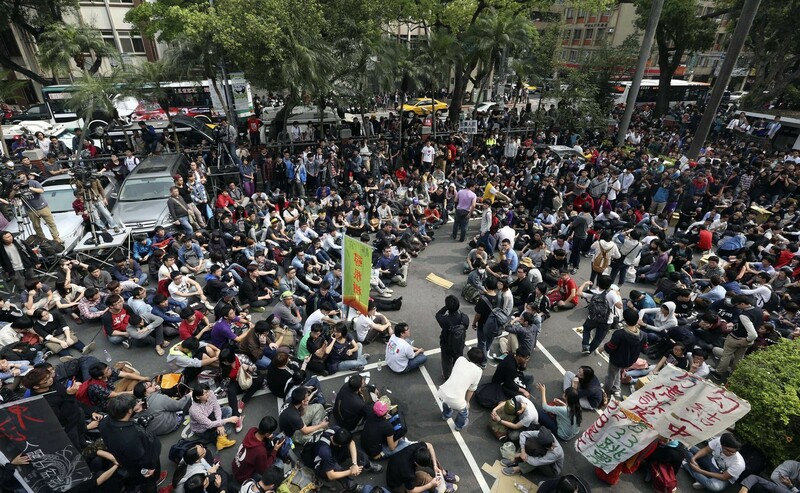 Clashes broke out when police tried to remove the protesters from the building and the compound surrounding it, with many lying on the ground with their hands linked to try to defy efforts to shift them. 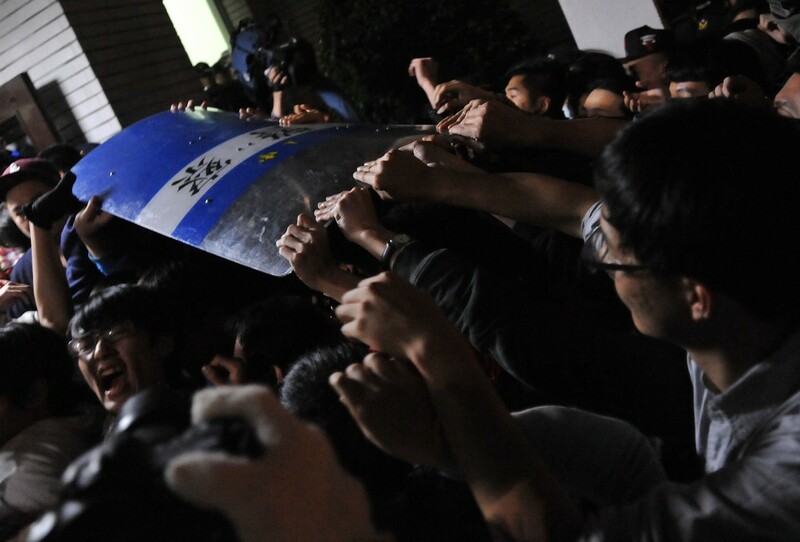 Police used riot shields to push the crowds back while some of the demonstrators tried to grab their batons and pelted them with plastic bottles. 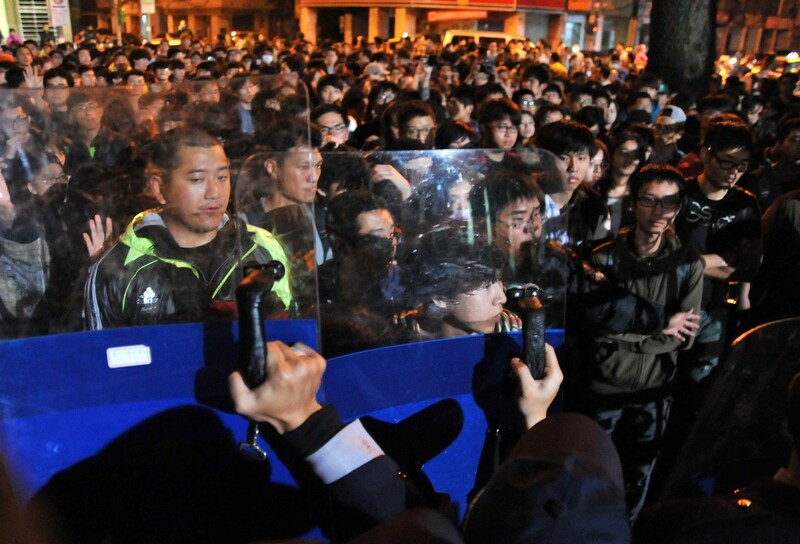 Two water cannon trucks were then deployed, eventually subduing the crowd and clearing the building. 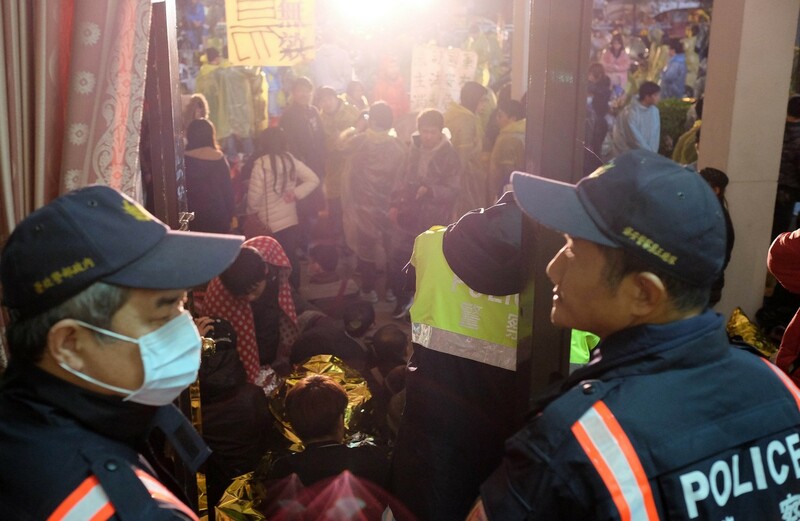 One injured male protester lay on the ground being attended to by medical personnel while another was led away with blood streaming down his face, AFP journalists saw. 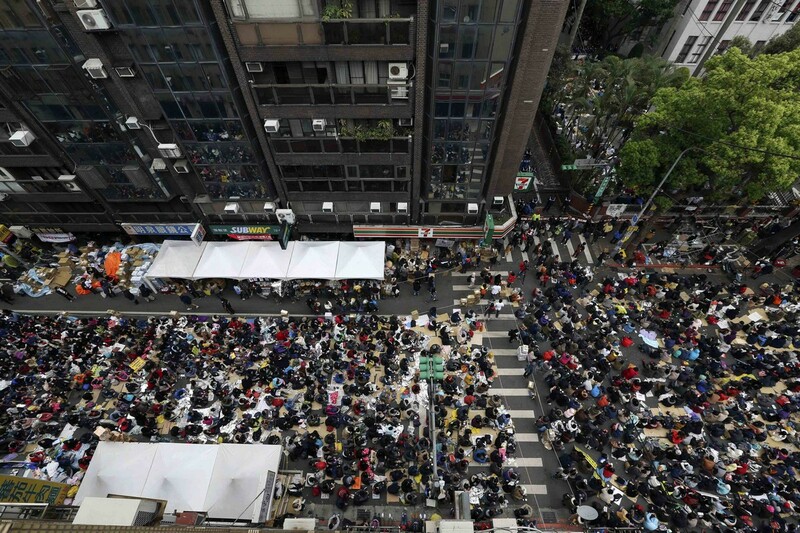 Taiwan's TVBS news channel said around 120 people were injured in the clashes, but police were not immediately able to confirm the figure. 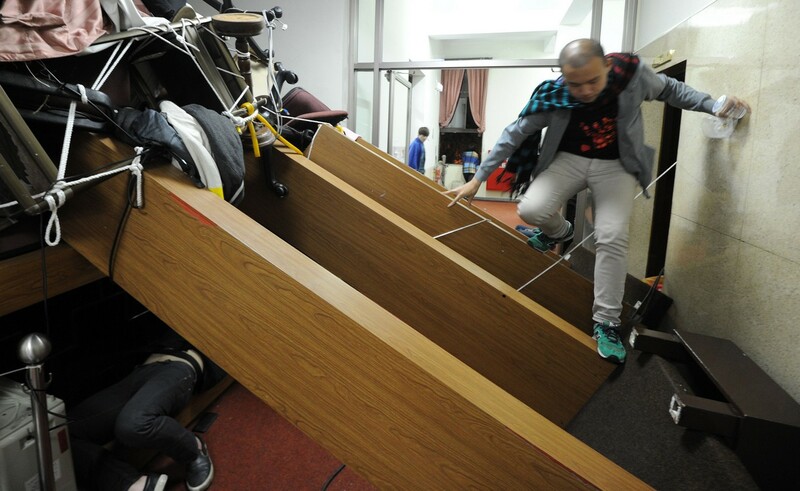 National Taiwan University Hospital which is located near the government headquarters said it had treated 57 injured people and police officers since late Sunday. 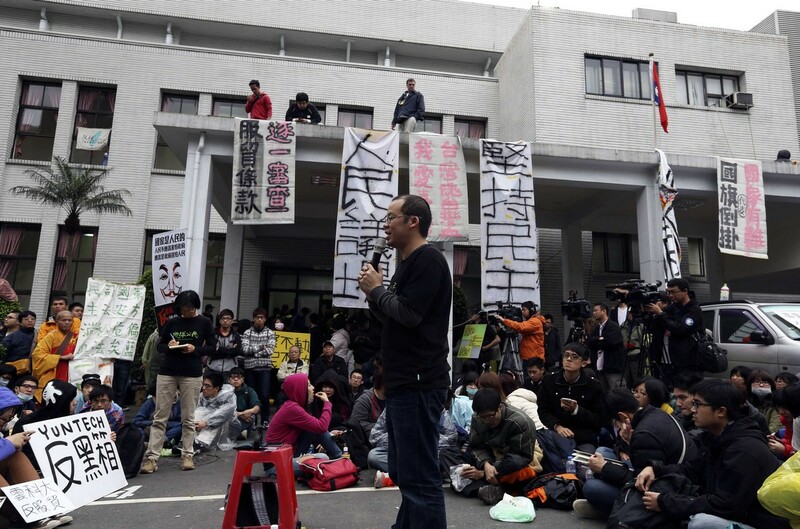 The protesters, who occupied the nearby parliament last Tuesday, are opposed to a pact with China which is designed to open up trade in services between China and Taiwan, which split 65 years ago after a civil war. 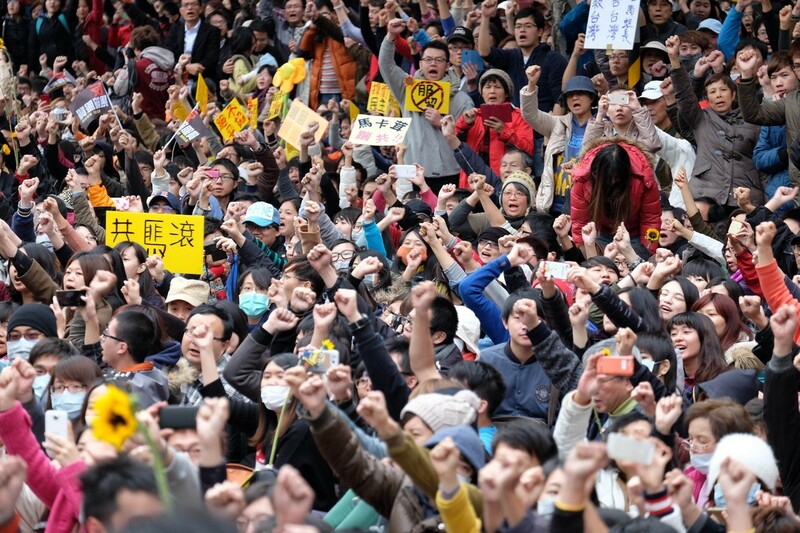 Opponents say it will damage Taiwan's economy and leave it vulnerable to political pressure from China, allegations rejected by Taiwan's ruling Kuomintang party. 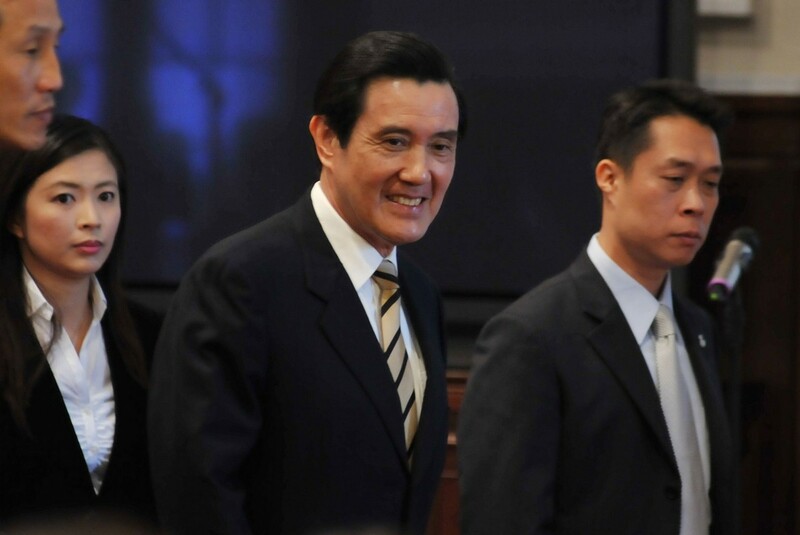 Taiwan President Ma Ying-jeou said that the island needed to pass a contentious trade pact with China for the sake of its economy. 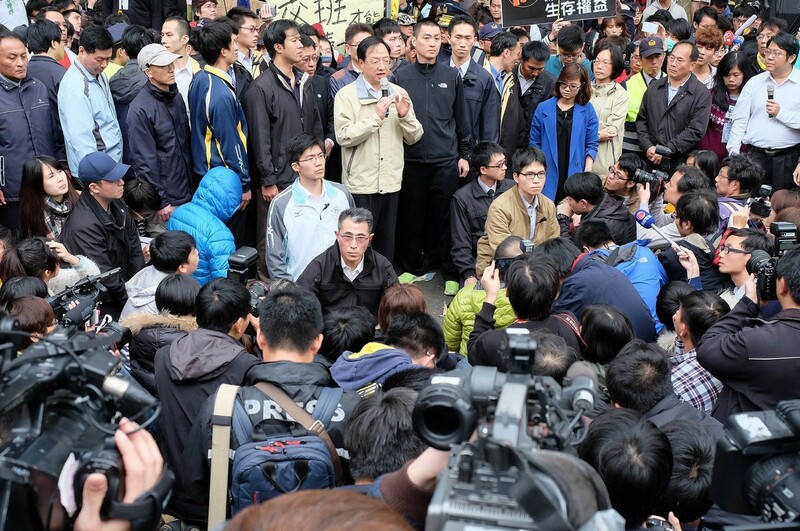 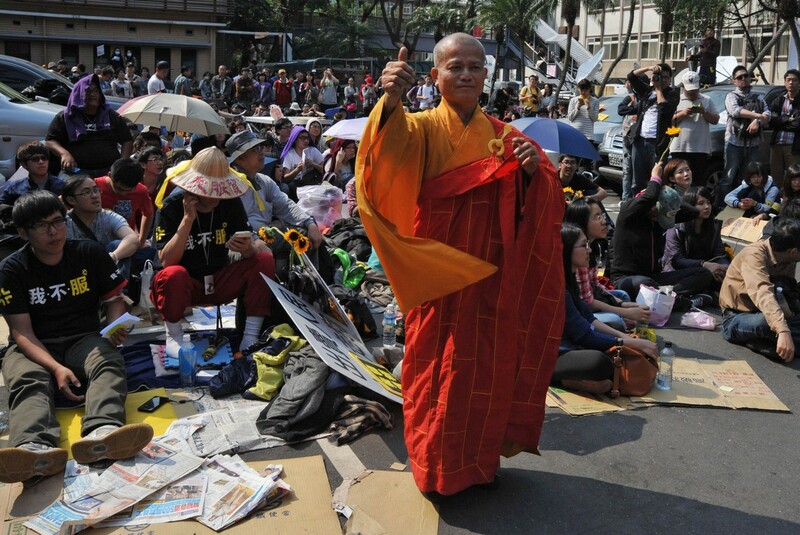 President Ma called on protesters who have occupied parliament in protest to respect democracy and leave. 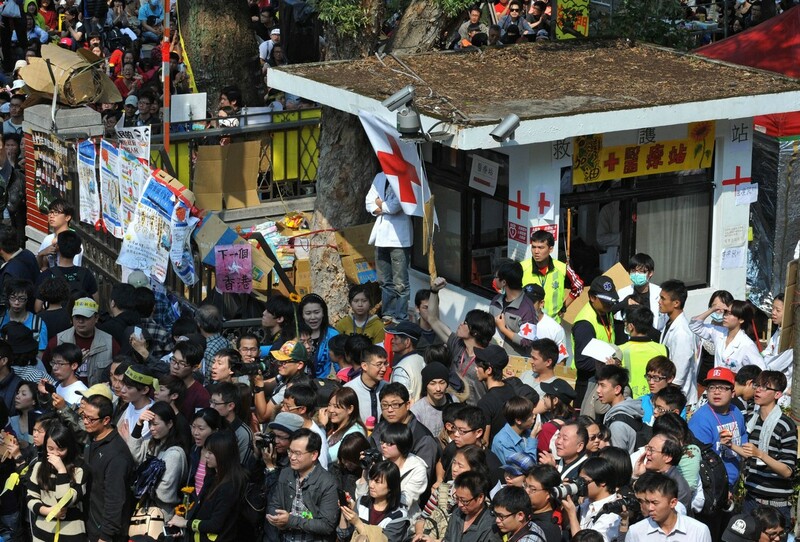 But the demonstrators who have taken over parliament and massed in the surrounding streets for the past five days fear the deal could further swell Beijing's economic influence over their proudly democratic island. 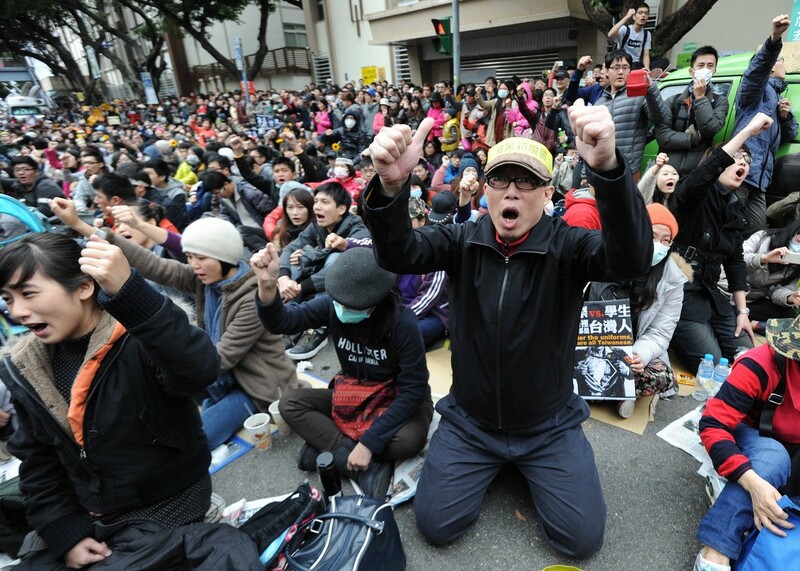 Speaking to reporters in Taipei, Ma said that Taiwan would suffer economically if it did not sign the agreement with its biggest export destination, China. 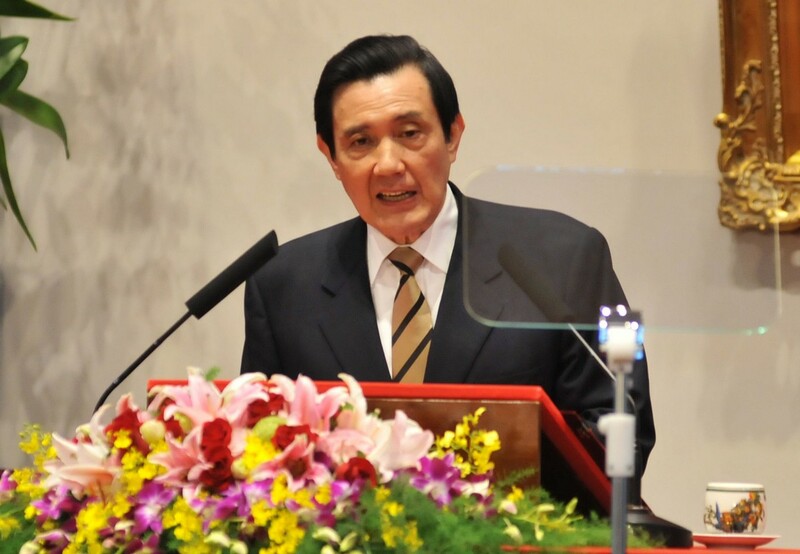 "I tell you once again, with a responsible attitude, that this is completely for the sake of Taiwan's economic future," said Ma, under whose rule since 2008 Taiwan has signed a series of landmark trade and economic agreements with China. 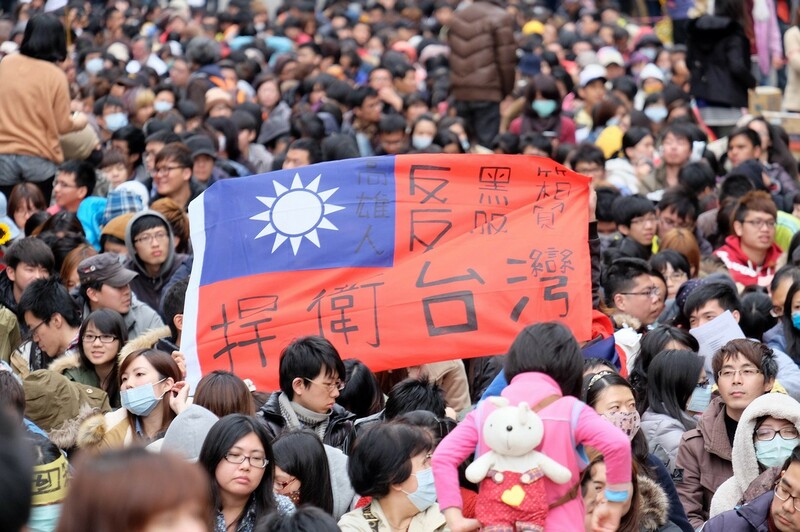 Parliamentary approval of the pact would pave the way for greater economic integration between the two former geopolitical foes, by opening 80 of China's service sectors to Taiwan and 64 Taiwan sectors to China. 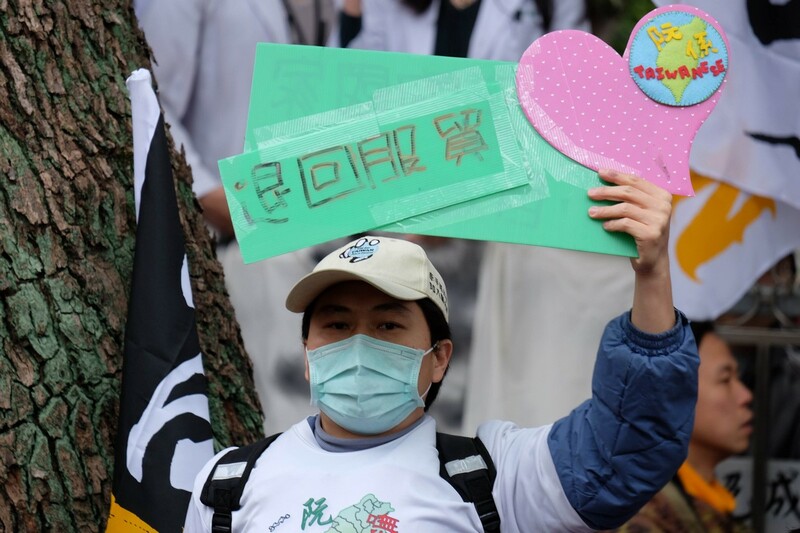 Ma and his ruling Kuomintang Party have promoted the pact, which faces a final review in parliament on April 8, as necessary to maintain Taiwan's competitiveness and status as an export powerhouse. 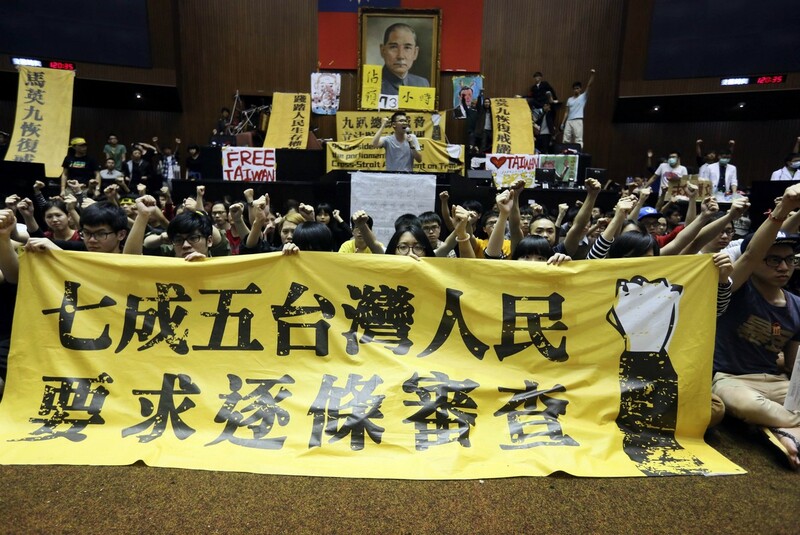 They have called it a precondition for Taiwan to join the Trans-Pacific Partnership, a wide-ranging trade deal among 12 countries, spearheaded by the United States. 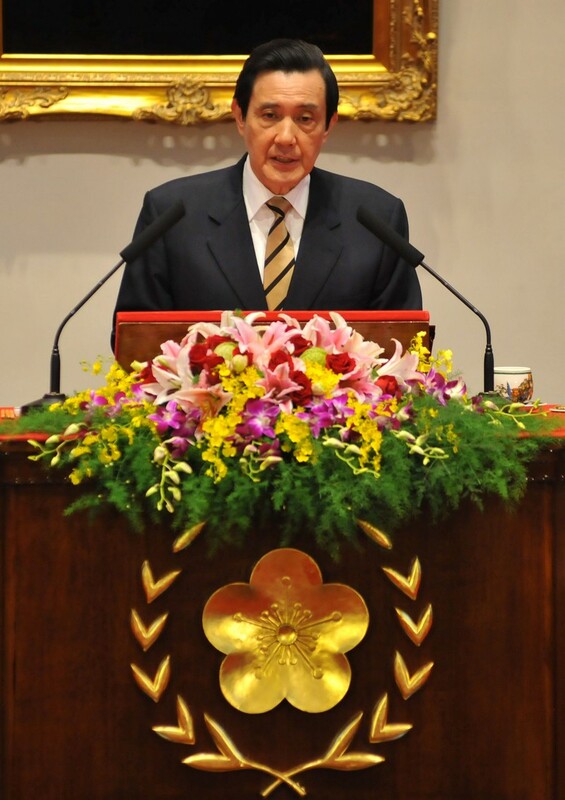 "I tell you once again, with a responsible attitude, that this is completely for the sake of Taiwan's economic future," said Ma. 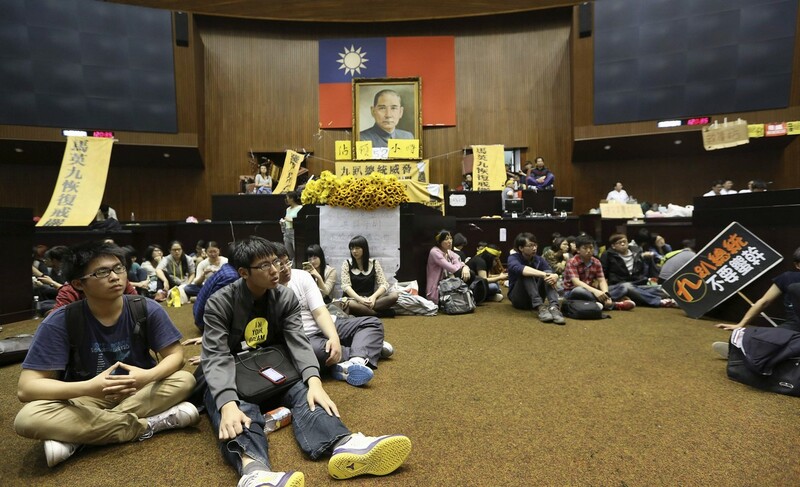 Ma said he understood the passion of the mostly young protesters, as "the country can only have a future if the youth care about the country and are brave enough to participate". 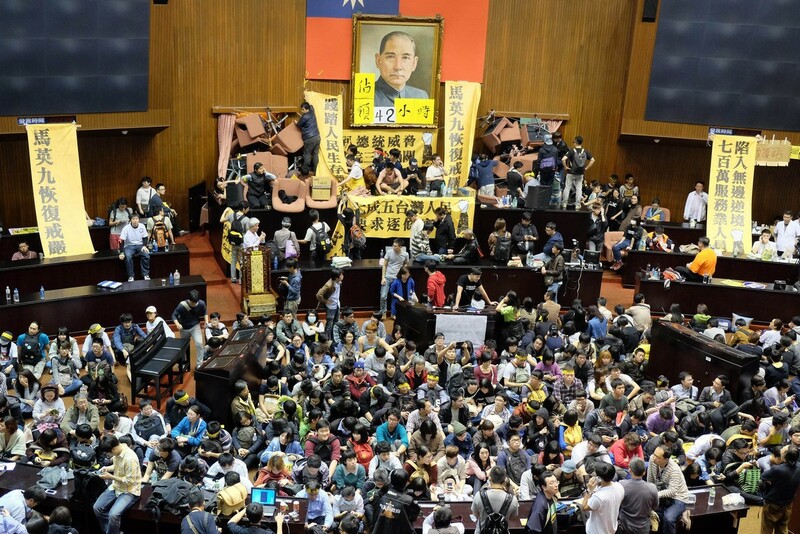 But he added that with their "illegal" occupation of parliament they were affecting the work of the government, and should withdraw. 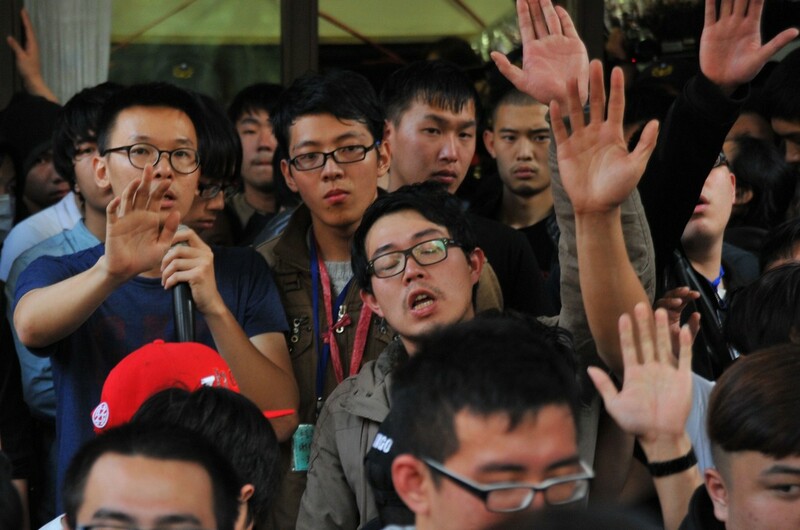 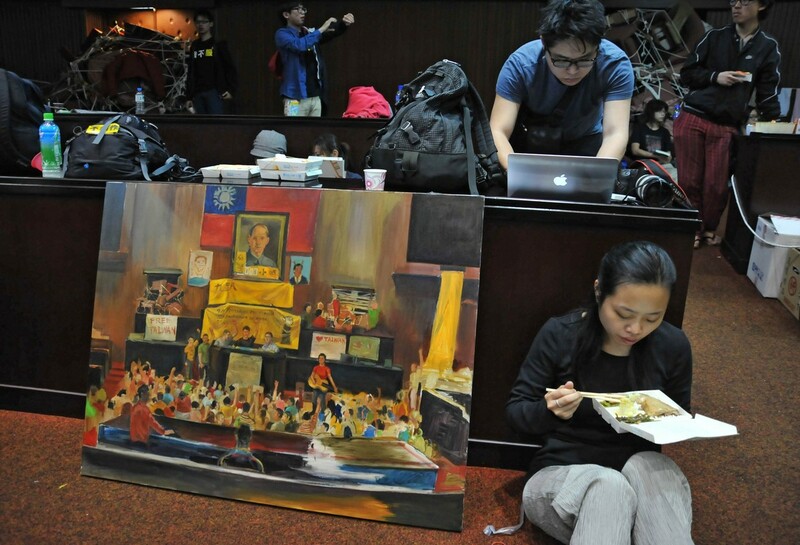 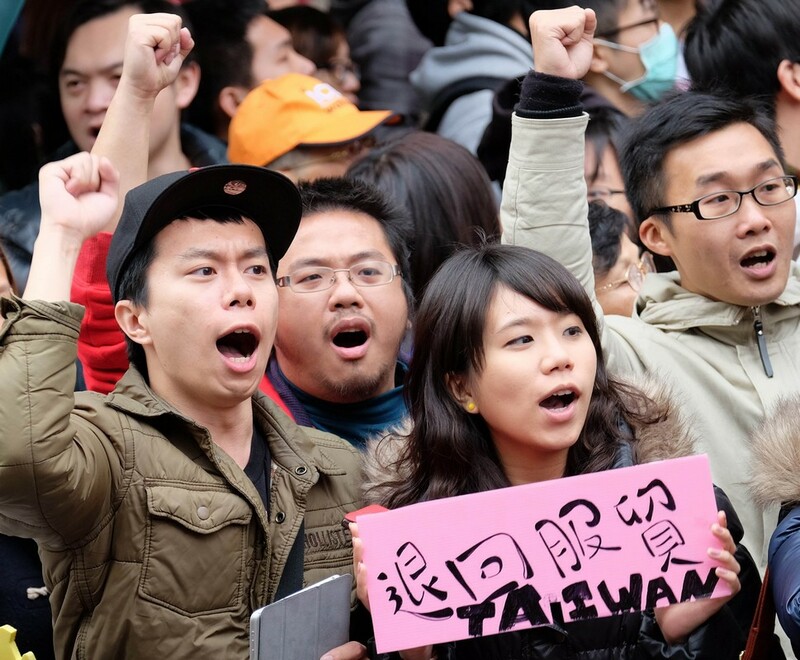 "Are we not proud of Taiwan's democracy and rule of law?" 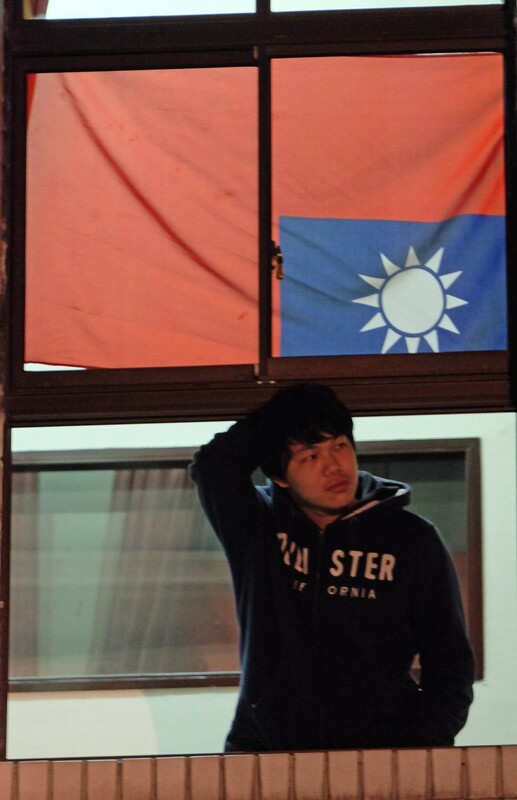 Ma said. 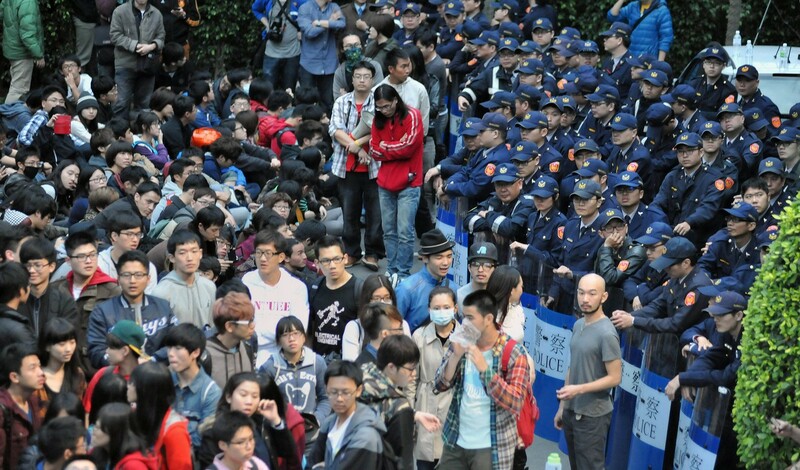 "If there is no rule of law, democracy cannot be protected -- this is the government's unswerving basic position." 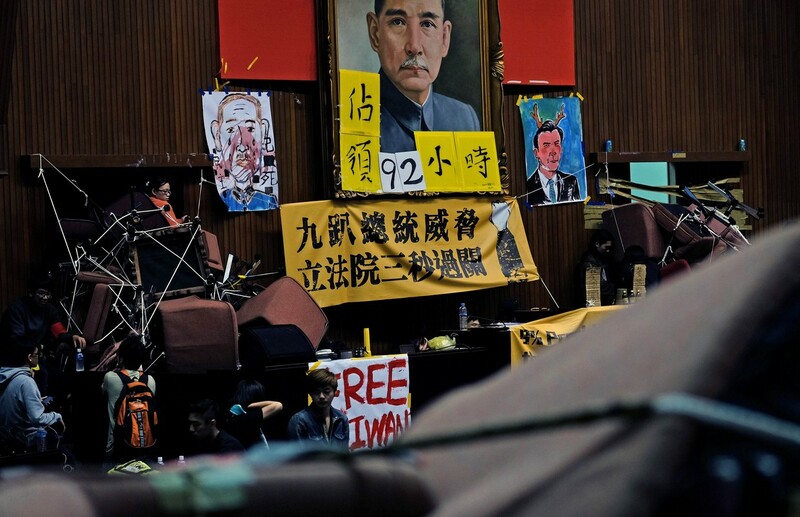 Taiwan is a former dictatorship that made a peaceful transition to democracy in the late 1980s, and now boasts one of Asia's most freewheeling democracies. 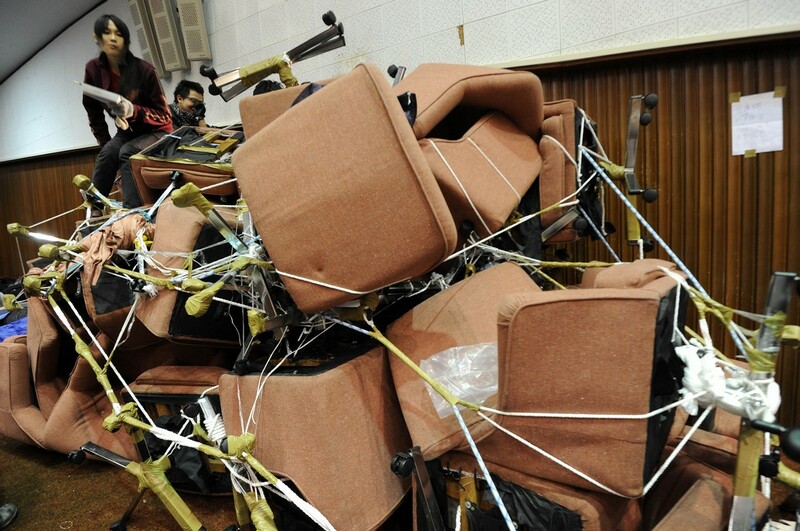 Fights in parliament are common and protests are almost a daily occurrence. 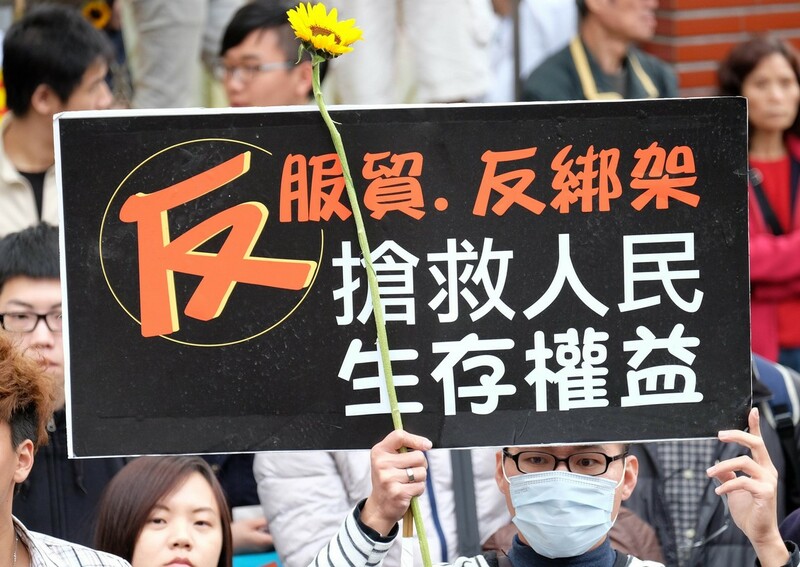 The main opposition Democratic Progressive Party has said it fears the pact will hurt small service companies and damage Taiwan's economy. 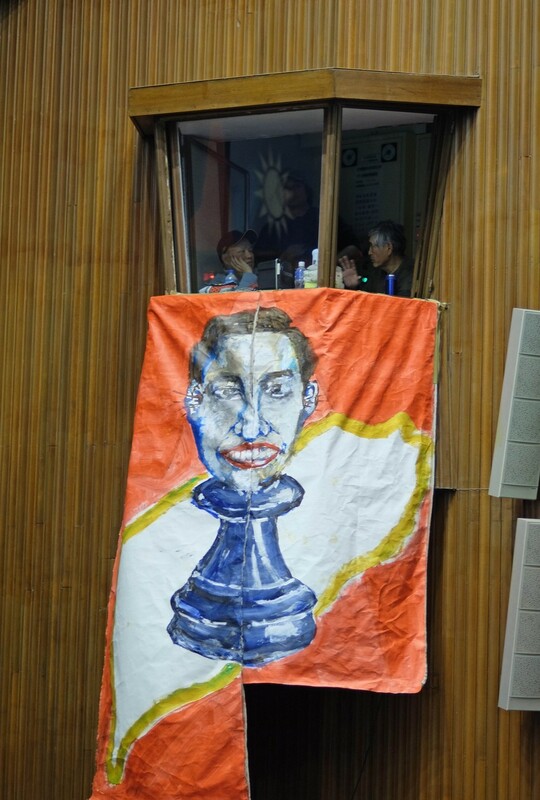 But it lacks the numbers to block the bill's final passage. 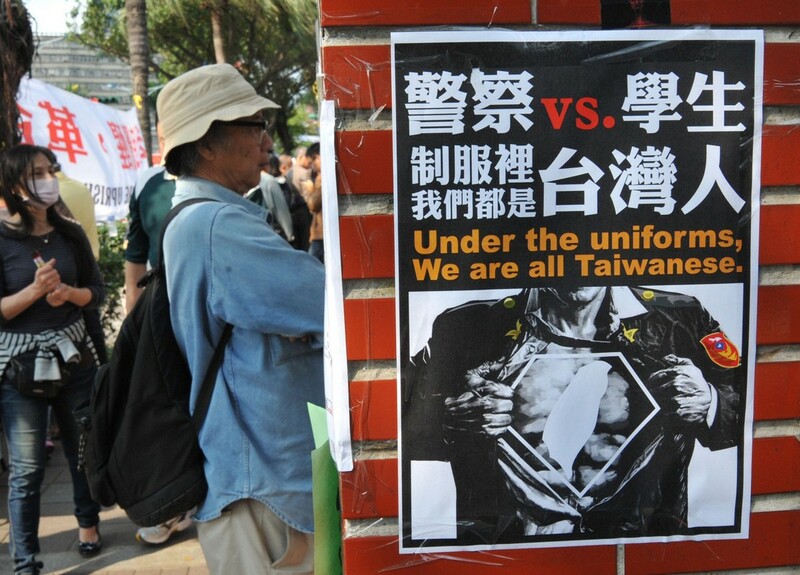 China still regards Taiwan as a renegade province, to be regained by force if necessary, and many in Taiwan are wary of the warming ties Ma's administration promotes. 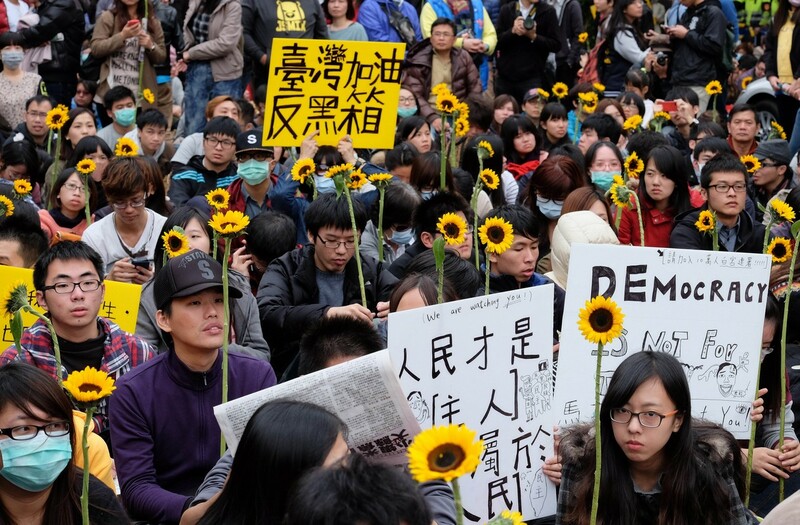 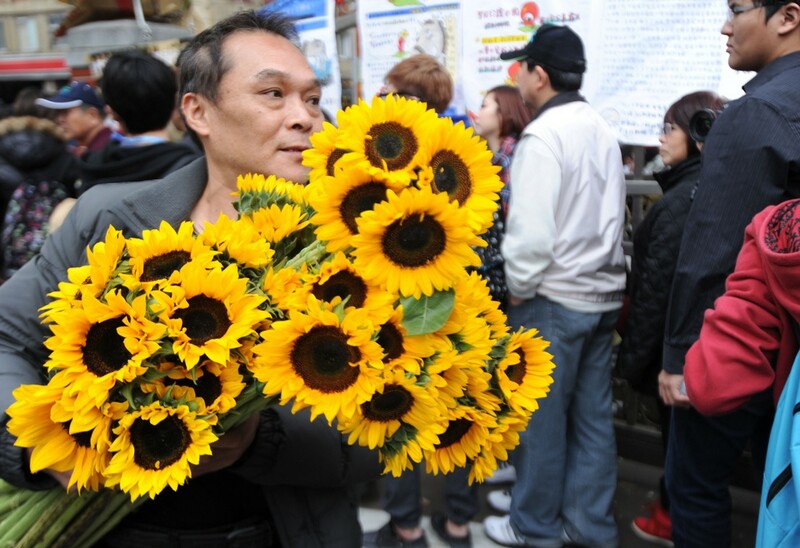 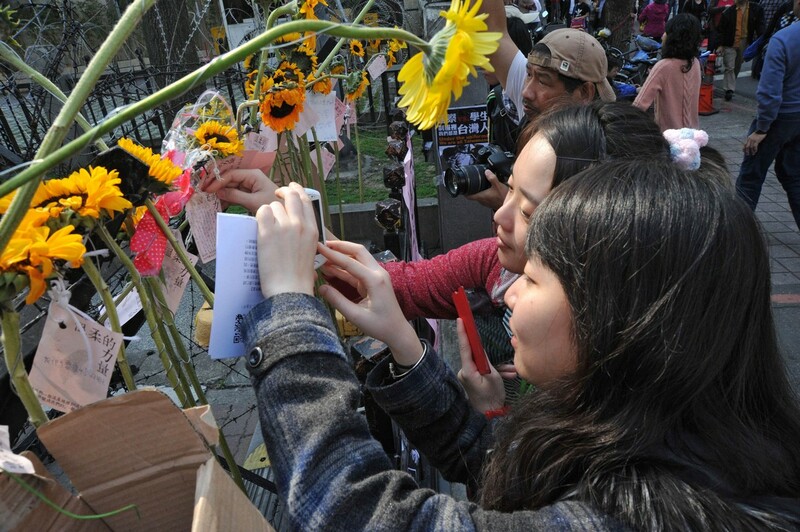 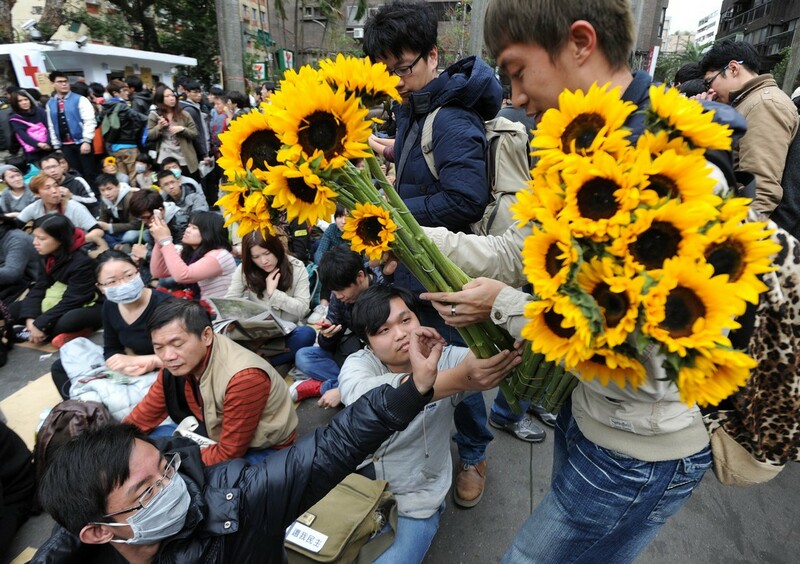 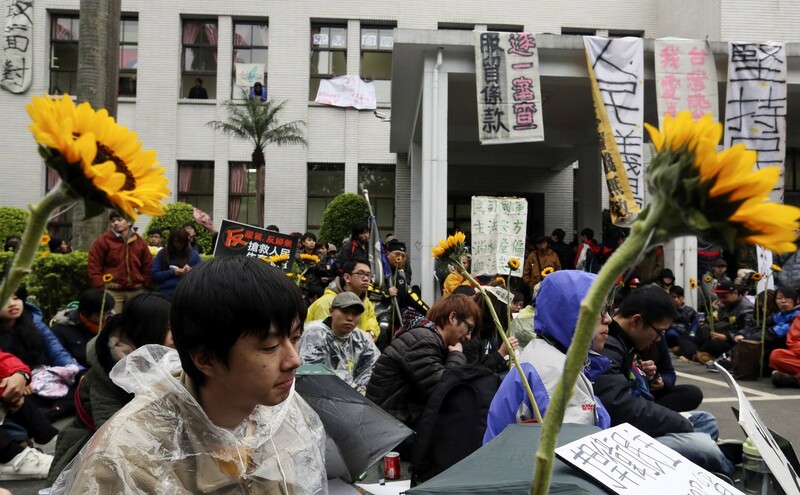 On Sunday, a large group of students ambushed the Executive Yuan, which is merely a short walk away from the Legislative Yuan - the headquarters of the ongoing "Sunflower Movement." 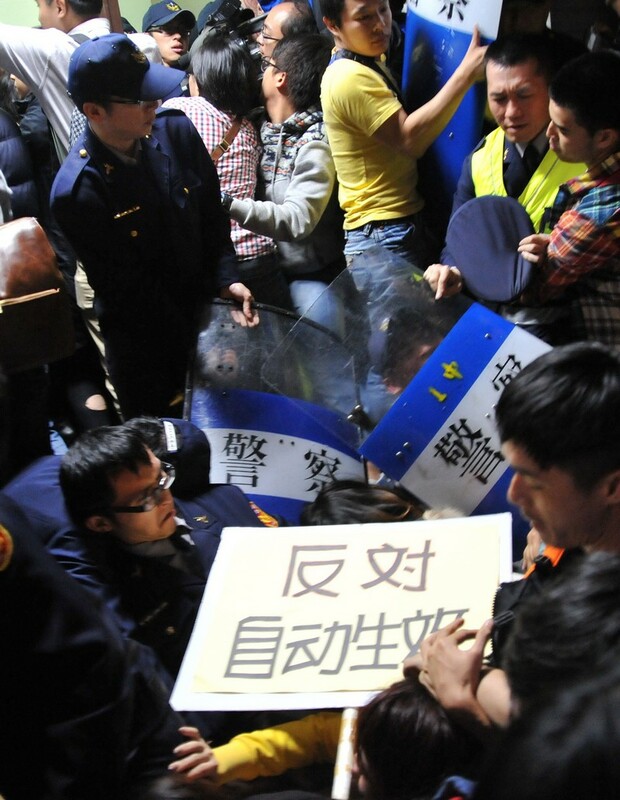 The protesters rammed through the barbed-wire barricades surrounding the Executive Yuan and clambered over the walls, making a dash for the main building as policemen put up a fight to keep them out. 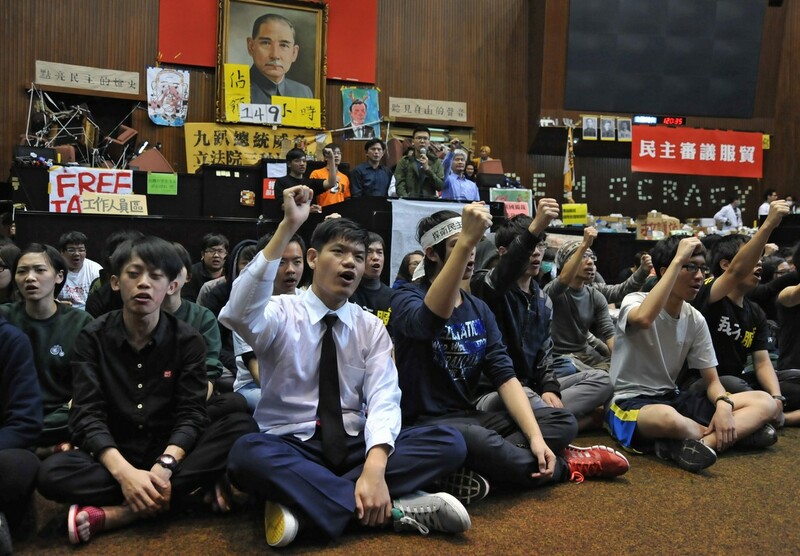 As a fierce struggle ensued, the students were heard chanting in unison for fellow protesters to "sit down! 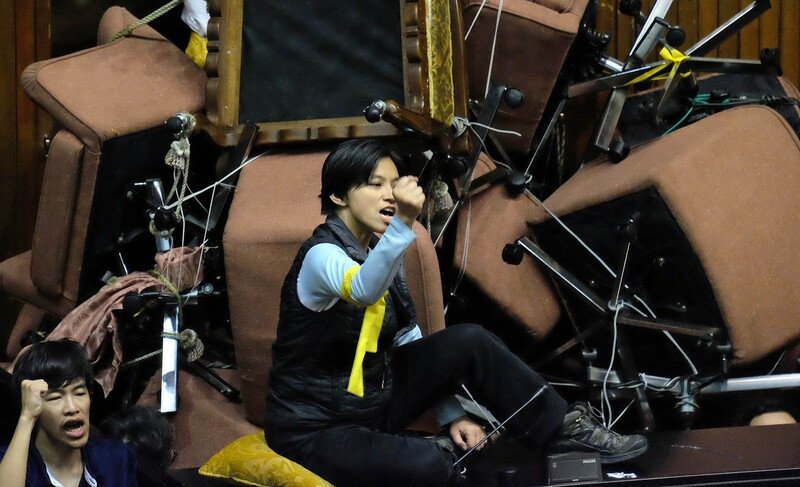 sit down!" 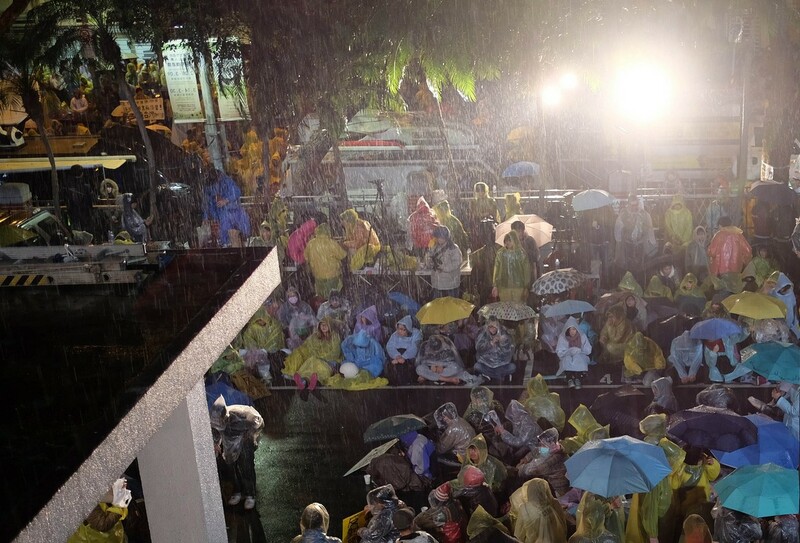 while others made their way into the building from a back entrance. 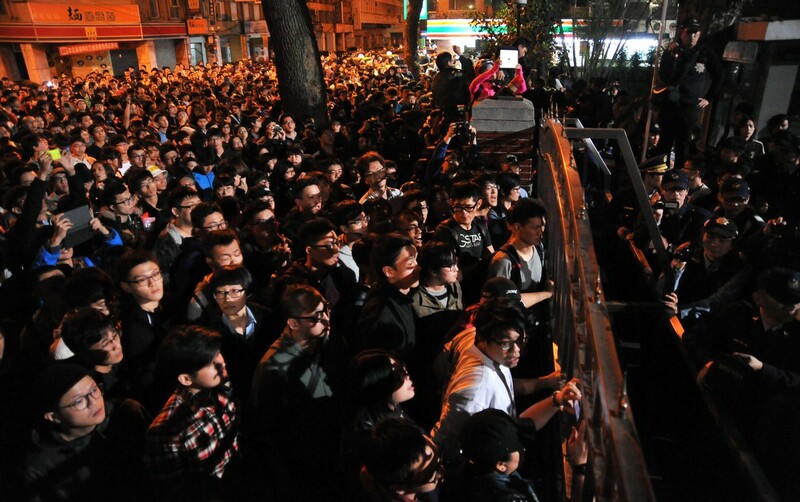 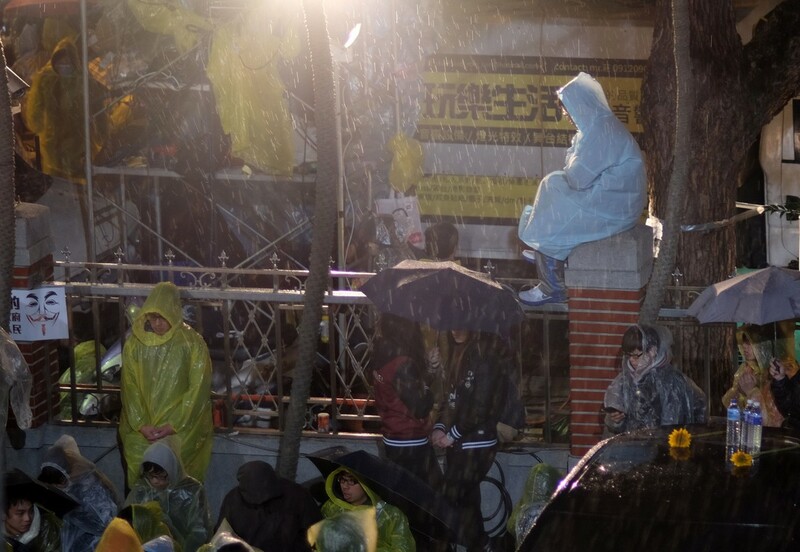 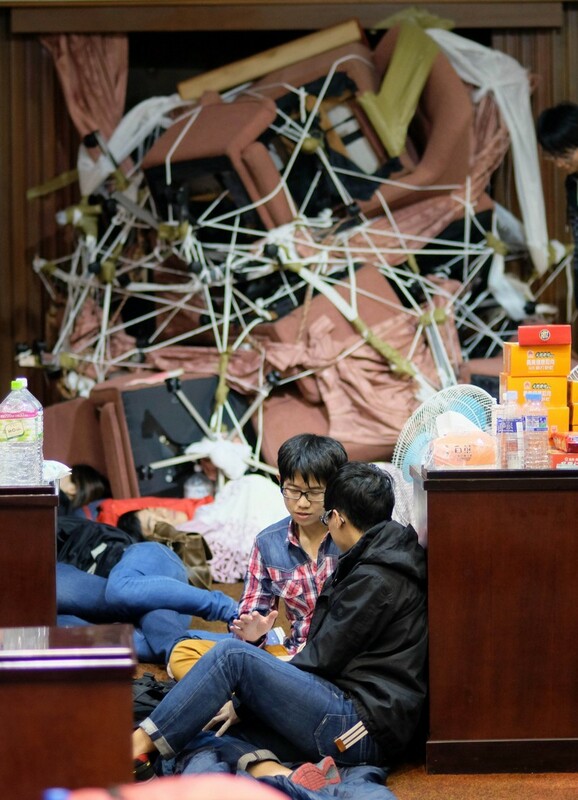 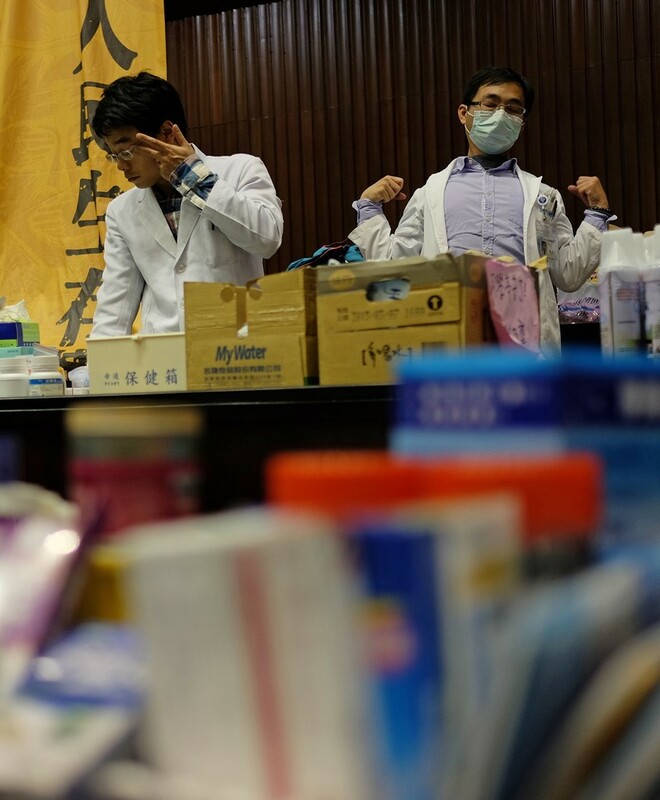 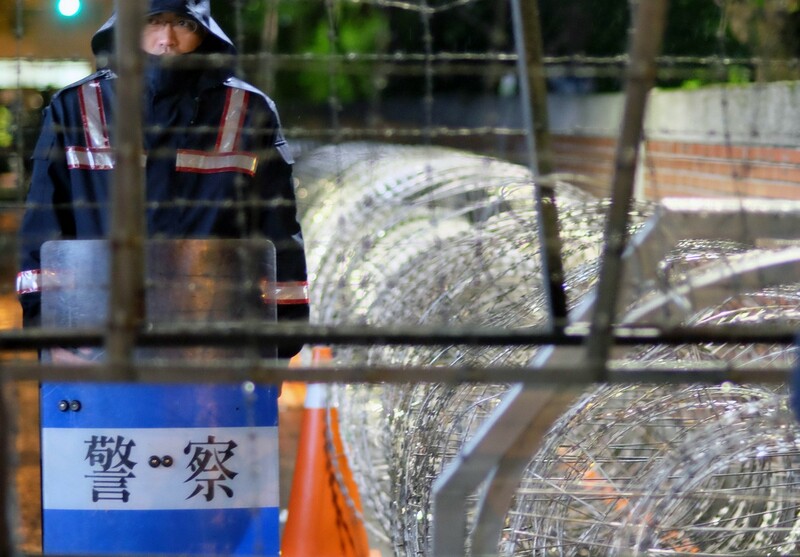 According to local media outlets, at least four or five students were scratched from climbing over the barricades, and eight rushed to nearby National Taiwan University Hospital. 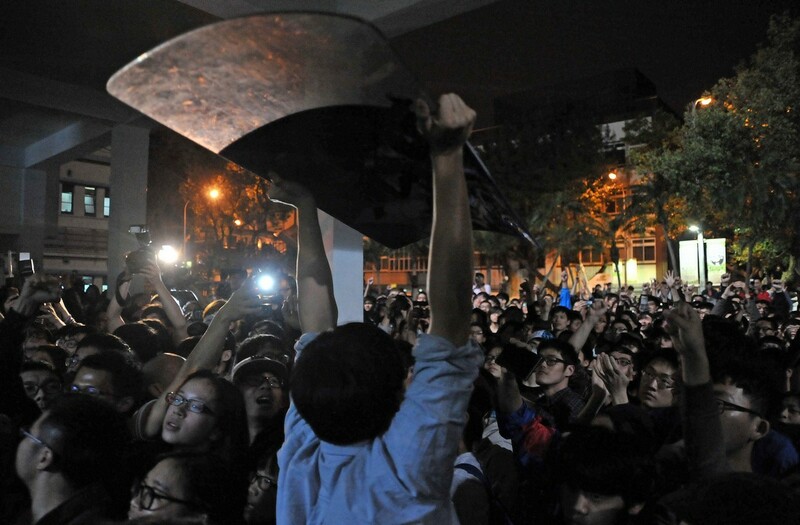 One student sustained electrical injuries when he allegedly broke into the generator room. 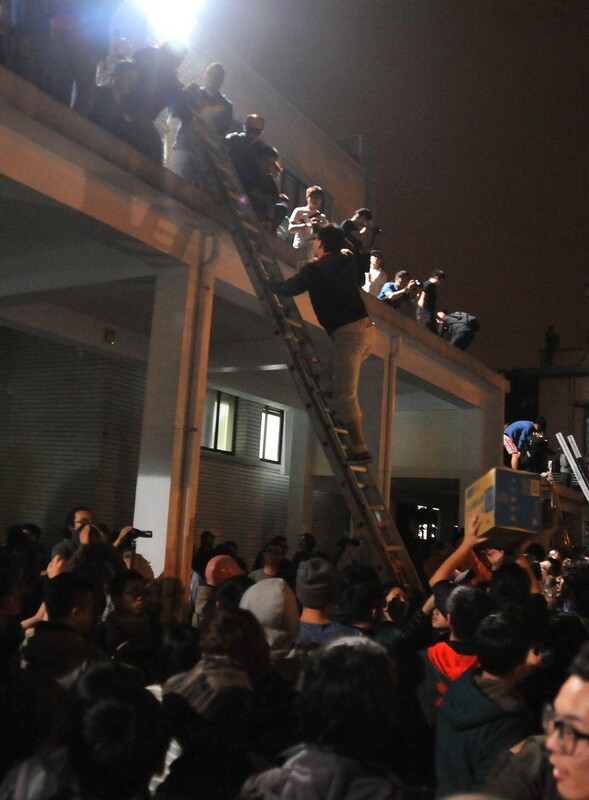 Some of the protesters broke windows at the back of the building and climbed through them to the second floor with the help of a ladder. 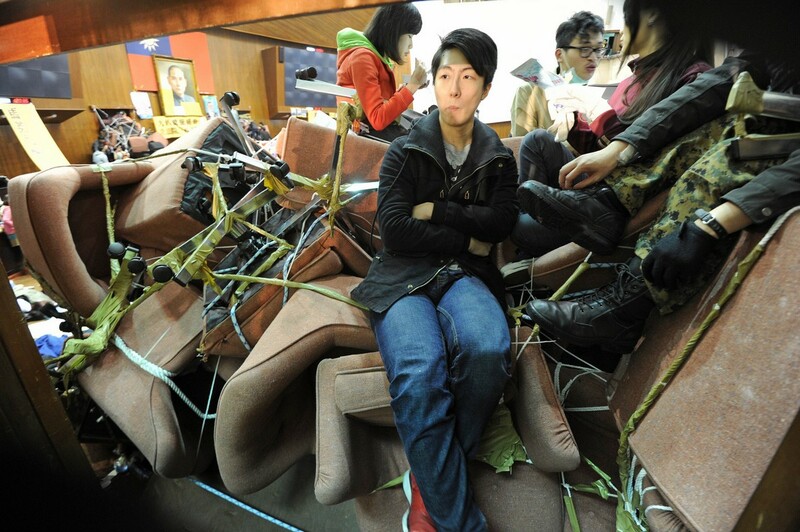 Protesters have successfully broken into the premier's office. 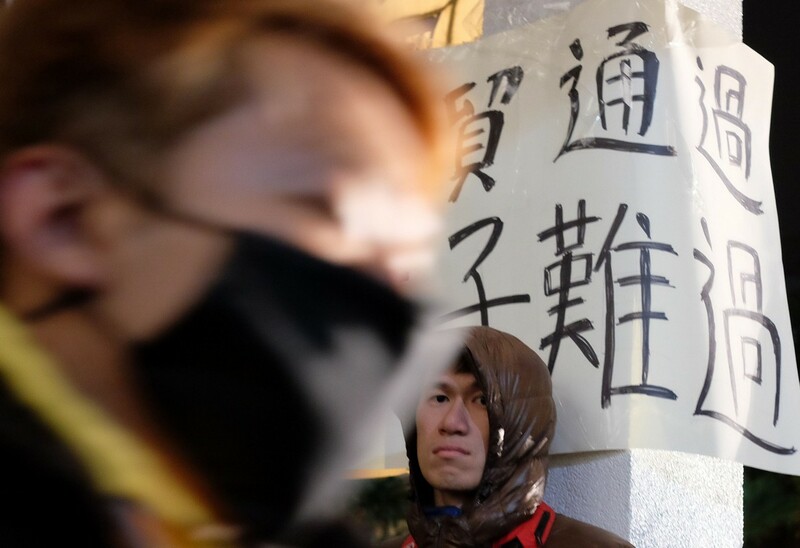 Student movement group "Black Island Nation Youth Front" stated afterwards that it was simply charged with relaying the news and that the students had acted of their own volition. 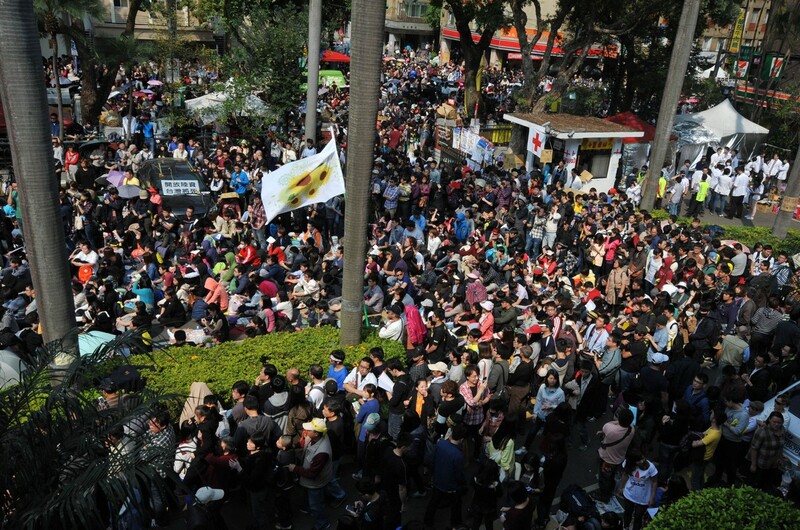 The press release announced that the students had decided to act when the government's executive power had consented only to review the Cross-Strait Trade in Services Agreement clause-by-clause but remained insistent that the pact was not to be withdrawn, contrary to the student's demands. 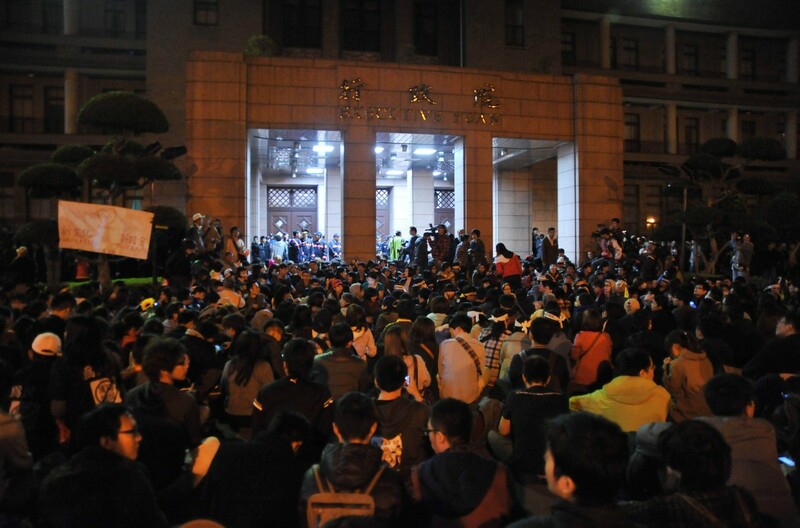 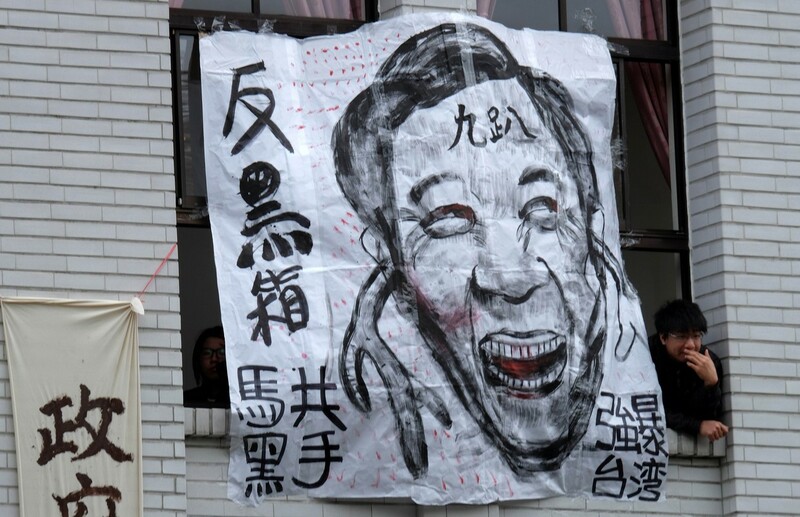 The students will also be calling for Ma and Jiang to take full responsibility for their actions; they demand that the president apologise and the premier resign. 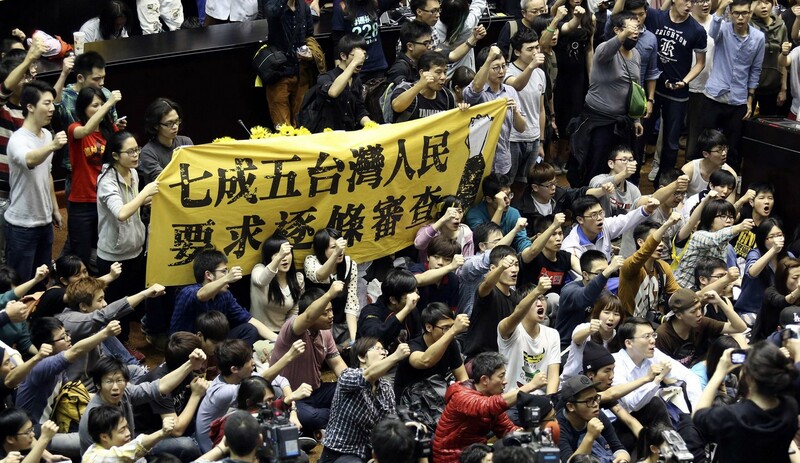 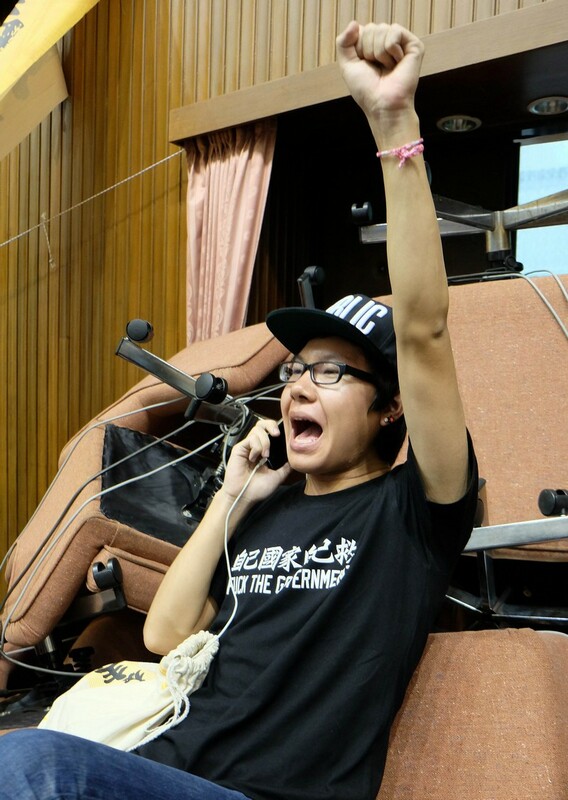 "We respect our fellow-protesters' actions in claiming the Executive Yuan," said student activist leader Chen Wei-ting (陳為廷), who seized the Legislature with student groups last Tuesday. 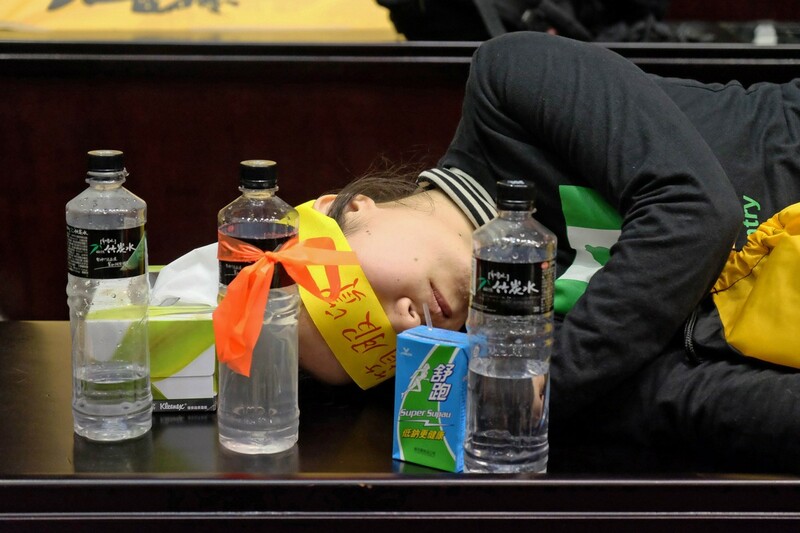 "The students who organised the action have raised the same demands as ours: that the pact should be withdrawn and that an official means of cross-strait inspection over signed agreements be established, etc.," said Chen. 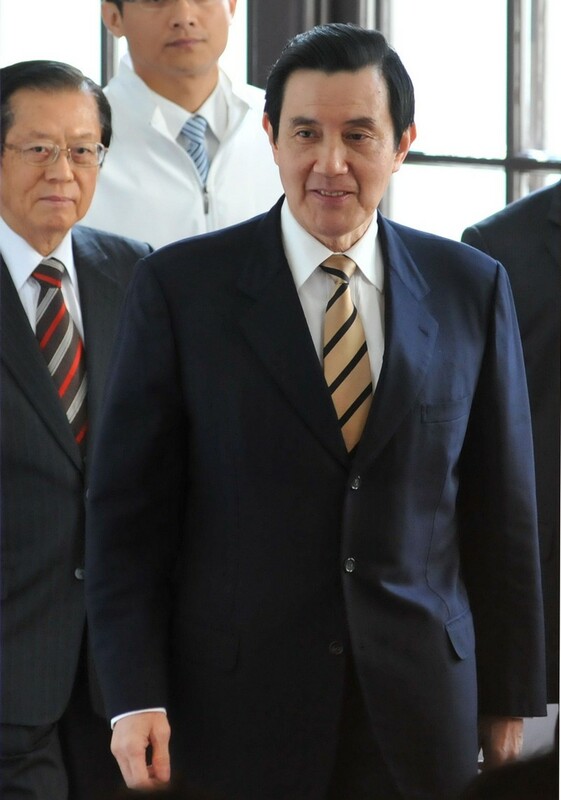 Rumours have been circulating that the groups' leaders and many members were starting to disagree with one another after the government failed to meet their demands. 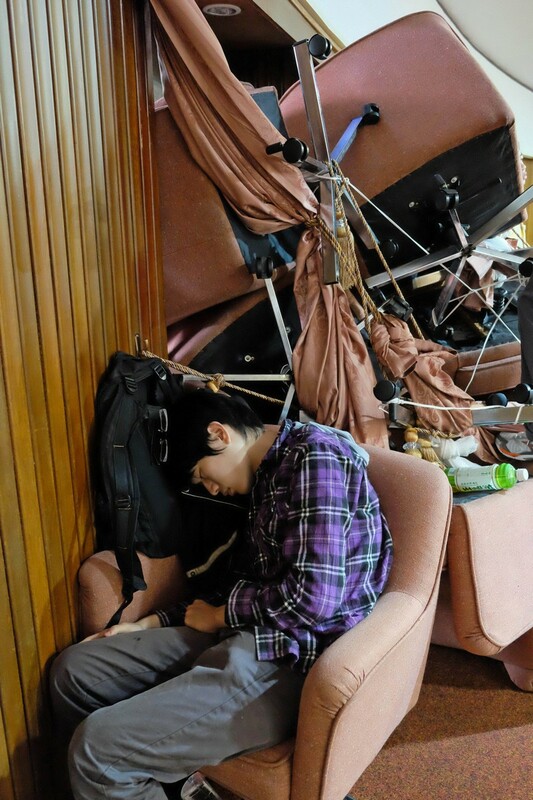 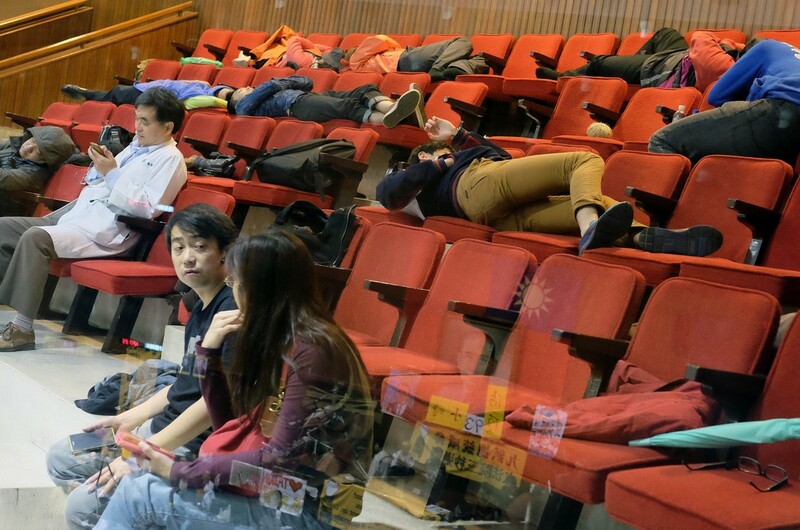 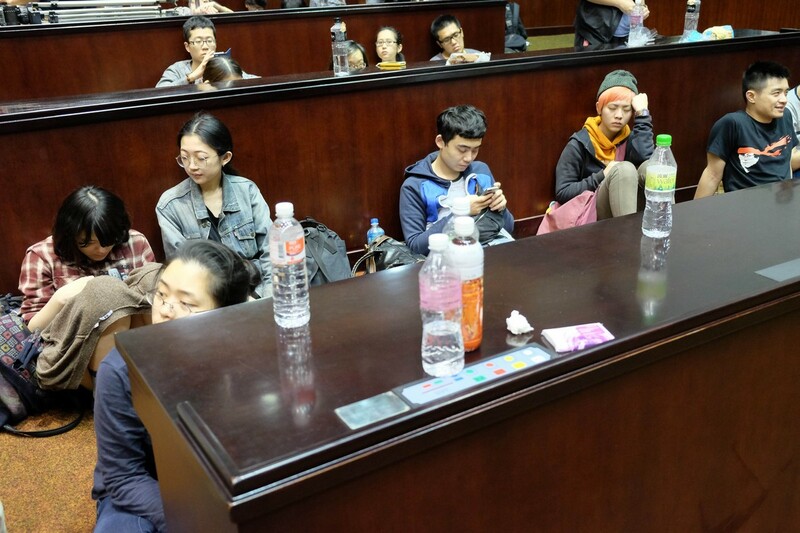 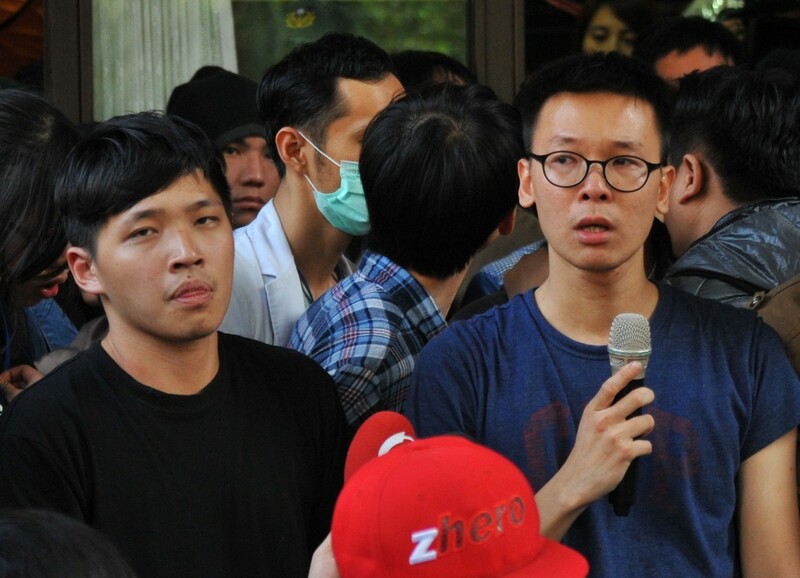 Some 50 students attempted to break through the doors of the Legislative Yuan, allegedly to take the matter into their own hands by leading demonstrations with an "elevated degree of violence." 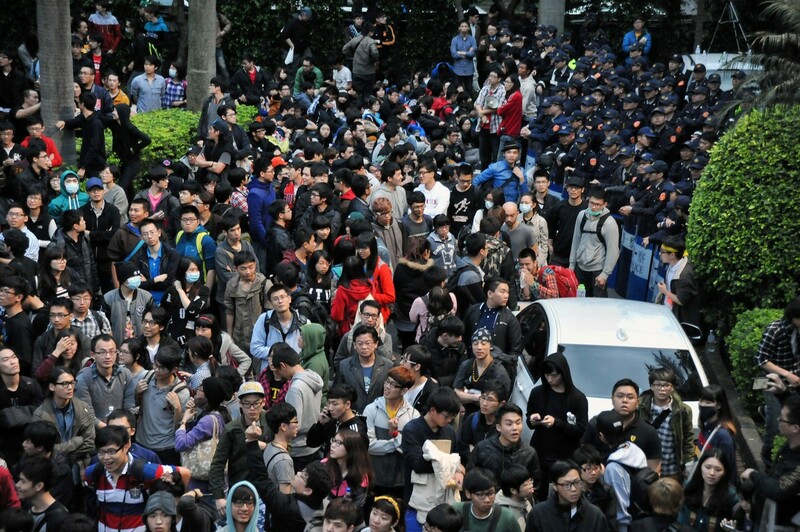 The students noted that they were disappointed by the effect of the peaceful protests. 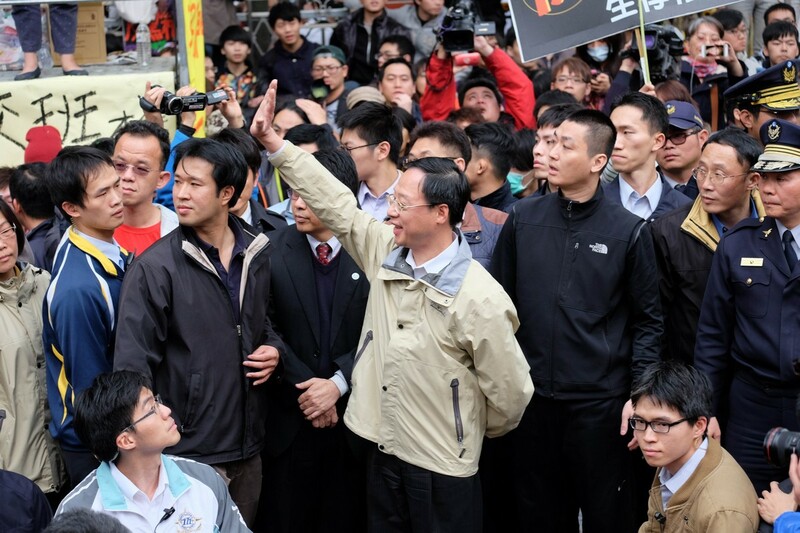 The Executive Yuan issued a press release after the break-ins last night, with Cabinet spokesman Sun Li-chun saying that Jiang was "deeply hurt that the students would do something like this." 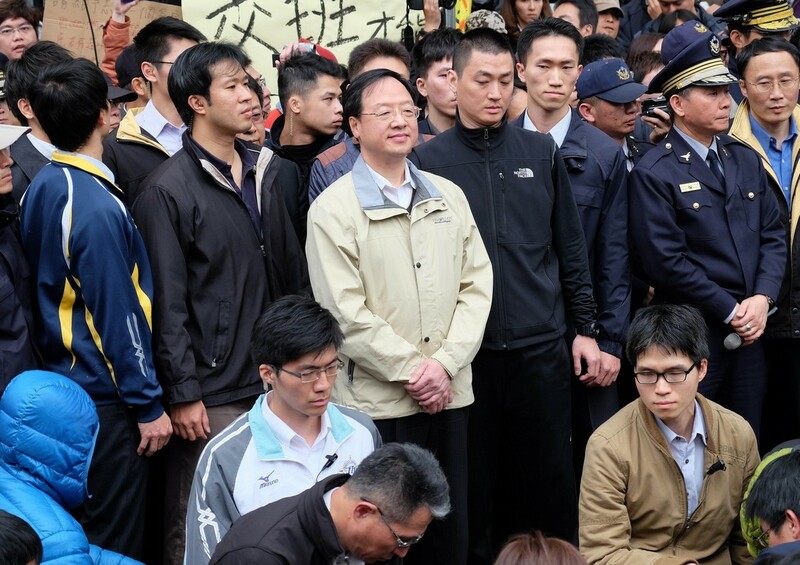 The premier also called for the National Police Agency (NPA) to dispatch extra police squads and "remove the protesters by and act according to law." 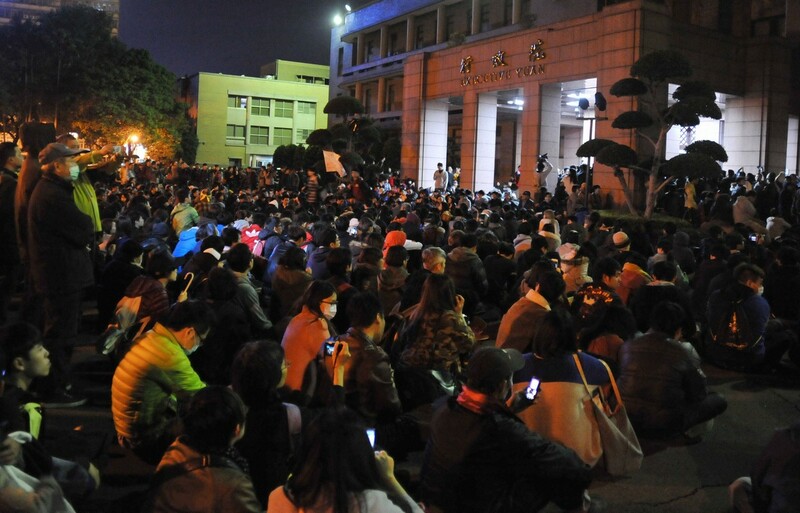 According to Presidential Office spokeswoman Garfie Li, the president told the premier that he fully supports the Cabinet's measures to deal with the incident. 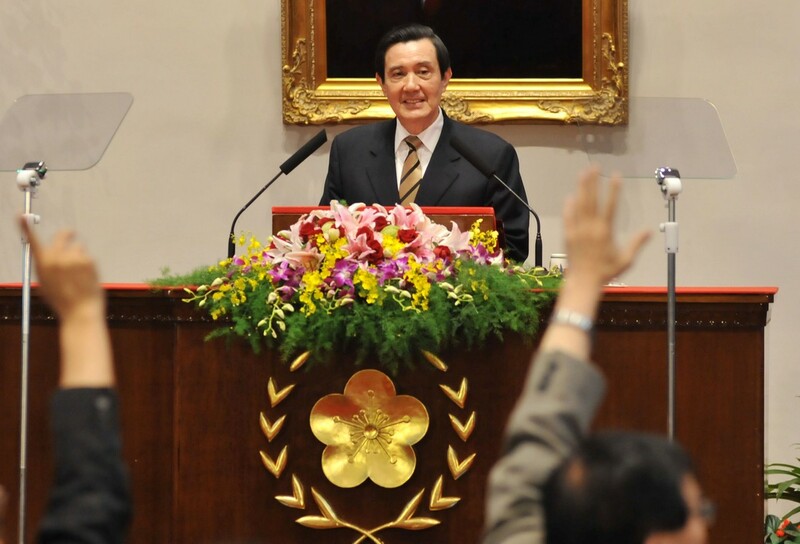 Ma and his ruling Kuomintang Party have promoted the pact as necessary to maintain Taiwan's competitiveness and status as an export powerhouse.